The last meal before the Christmas break was a lively one. 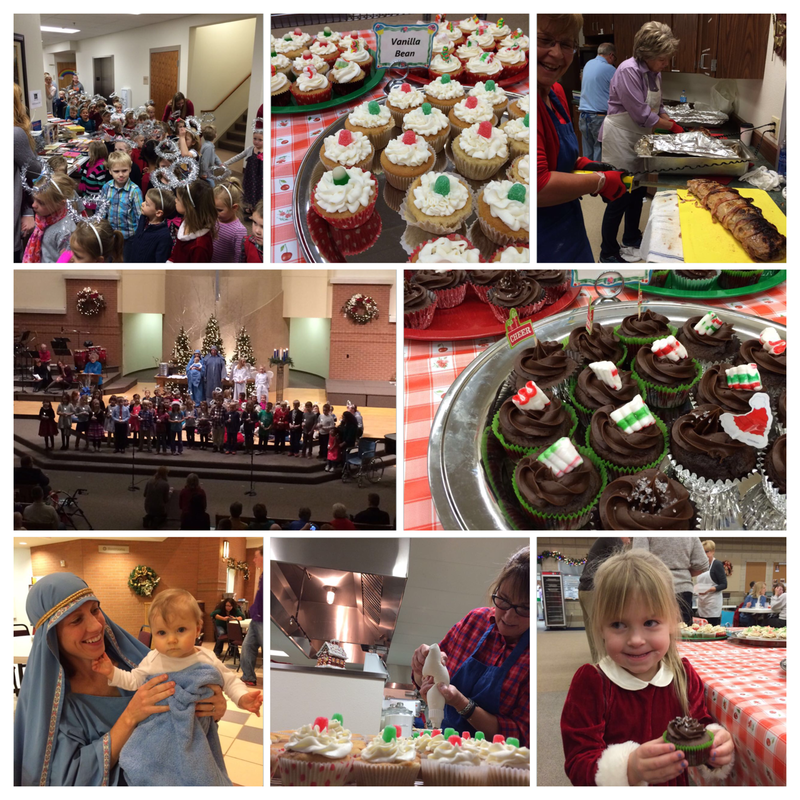 We served 620 diners with 260 pounds of honey-bourbon glazed pork loin roasts, 30 pans of potato casserole, spinach salad, dinner rolls and 72 dozen cupcakes. After dinner, we had a wonderful live nativity service with singing angels, friendly beasts, and appearances by shepards, wisemen and the Holy Family. It was an evening filled with the spirit of Christmas. 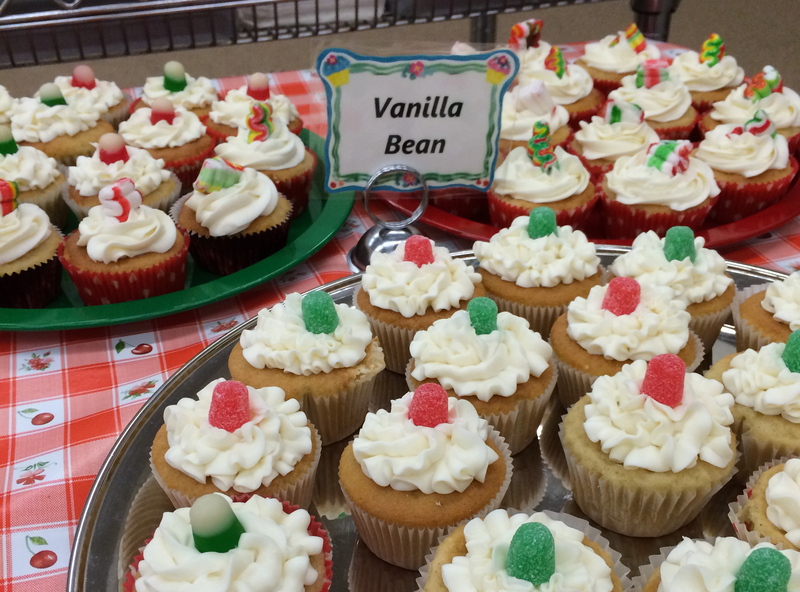 Here’s a recipe for our homemade vanilla bean cupcakes. We think these are more flavorful and less likely to fall apart than the ones from a mix. We topped them off with Gold Medal Vanilla Cream Ready to Use Icing from Sysco and Christmas candies. Heat the oven to 350 F and line muffin pans with paper liners. In a bowl combine the flour, baking powder, baking soda, and salt. Whisk until well blended. In mixer, cream together the butter and sugar until well combined and lighter in color. Add the eggs and beat until completely incorporated into the butter mixture. Beat in the buttermilk. Add dry ingredients to wet, mixing just until combined and no large lumps remain. Fill paper cups about 3/4’s full and bake for 18 to 22 minutes, or until the cakes spring back when pressed gently in the center. Allow the cakes to cool in the pan for five minutes then carefully transfer them to a wire rack to cool completely. 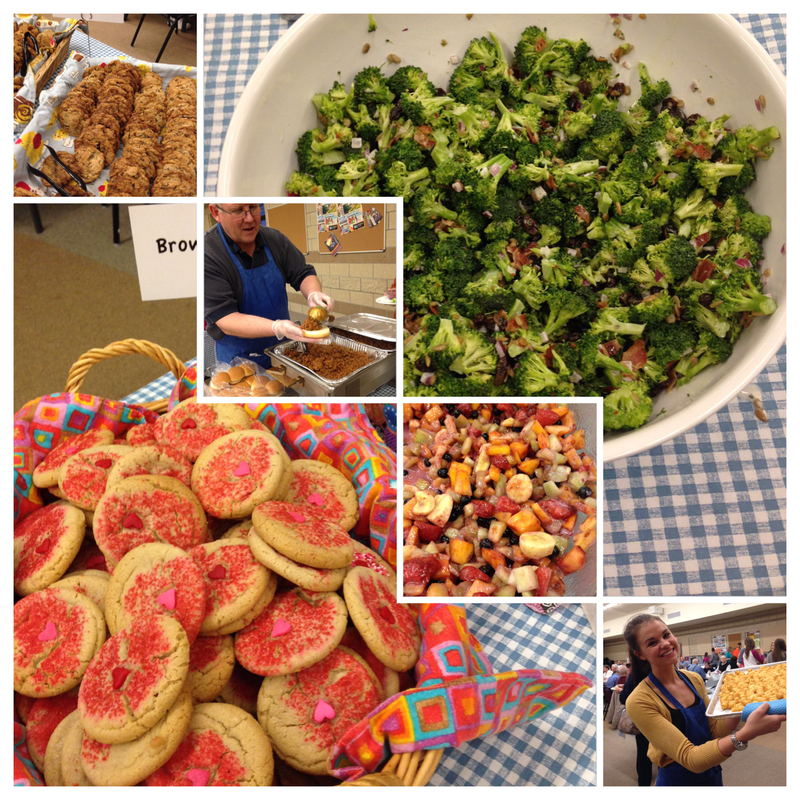 After the Christmas break, we started off the year with a Sloppy Joe Dinner, complete with Tater Tots, a crunchy Broccoli Salad, a nice fresh fruit salad and lots of homemade cookies. Blend bananas, lemon yogurt, sugar and lemon juice in blender until smooth. Chill dressing for up to 2 hours. Toss with fruit to serve. 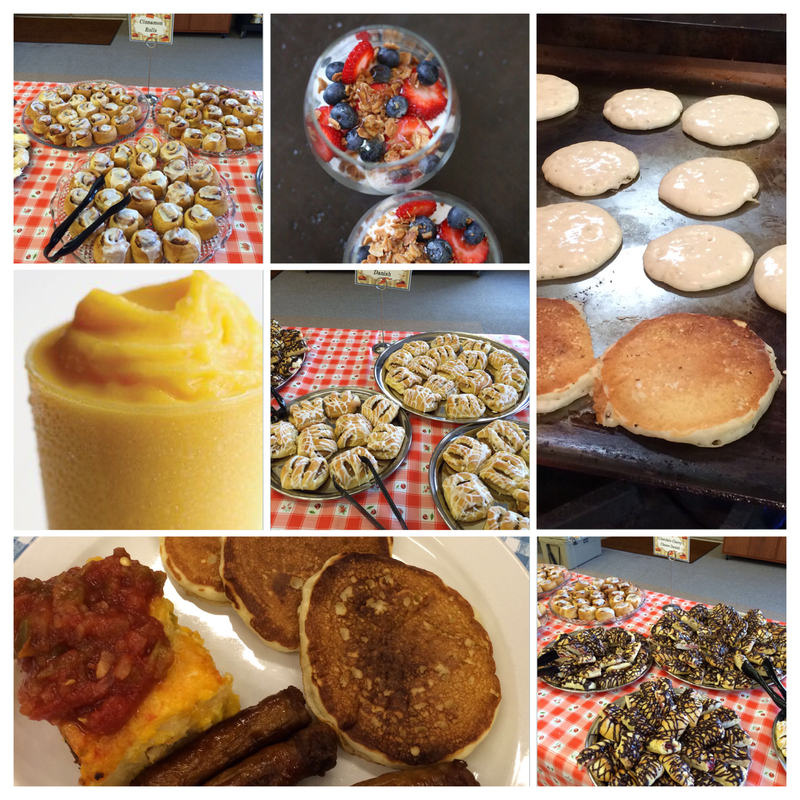 And then last week, we served 450 with Breakfast for Dinner, including 1000 homemade pancakes, 32 pans of Egg and Hashbrown Potato Casserole, 36 quarts of yogurt with fruit and granola, 1400 link sausages, fruit smoothies, 300 mini cinnamon rolls and 400 danishes. Saute’ onions and peppers in olive oil. In a half size disposable buttered pan, layer 1# of the potatoes, then the peppers and onions, then 1 ½ cups shredded cheddar cheese. Spread remaining hash browns over top. Whisk the eggs in a separate bowl and add salt, pepper, mustard and garlic. Pour over the potatoes. Cover, refrigerate 8 hours or overnight. Heat oven to 325*. Uncover; bake 60 minutes or until 165*. Sprinkle with remaining 1 cup cheese. Bake 3-5 minutes longer. So that’s what we’ve been up to in the Calvary Kitchen. Coming up this week: Meatloaf and Mashed Potatoes. Next week: Spiral Sliced Ham and Broccoli Rice Casserole. See you in church!